This sensitive makeover of a down-at-heel house reframes its architectural heritage for the 21st century. 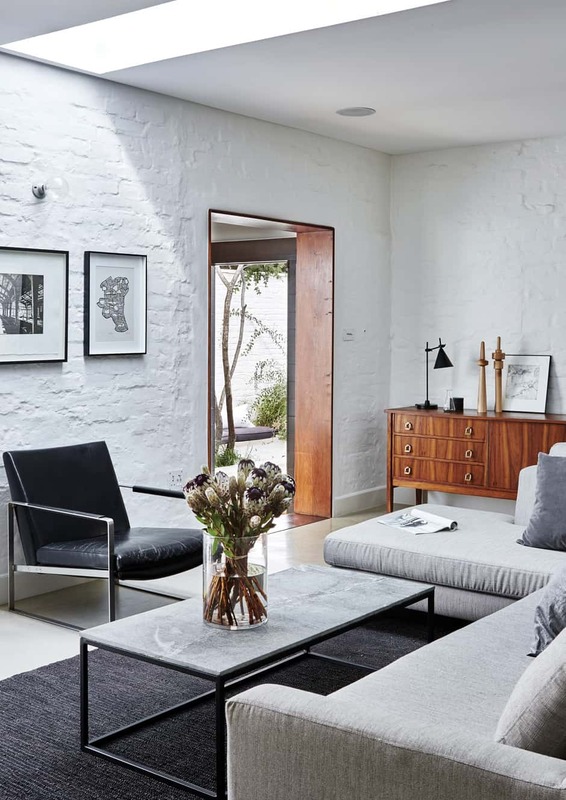 When Nico Venter and Christo Vermeulen found their home in the Johannesburg suburb of Parkhurst, it was in a dilapidated state: ceilings destroyed by a leaky water heater and with not much of historical value to preserve. Parkhurst houses were originally built en masse for servicemen returning from World War II, and were typically little brick houses with corrugated iron roofs and street-facing verandahs. They gave the area its distinctive character, and although they were humble homes, today they’re much sought after. Nico is an urban designer and Christo’s a textile designer turned builder-renovator, so they designed their renovation together, then Christo built it. Their interest in architecture informed their design, which ended up being a playful essay on modernising respectfully, involving a rich dialogue between past and present, home and city. At the same time, it’s simple and comfortable to live in. LIVING Once dark and dingy, this now light, open space is filled with vintage and contemporary furniture that appears to float above the floor. A number of Christo’s own creations in this room, made by his company Muse Contracts, feature slim steel frames that don’t create visual and physical barriers. 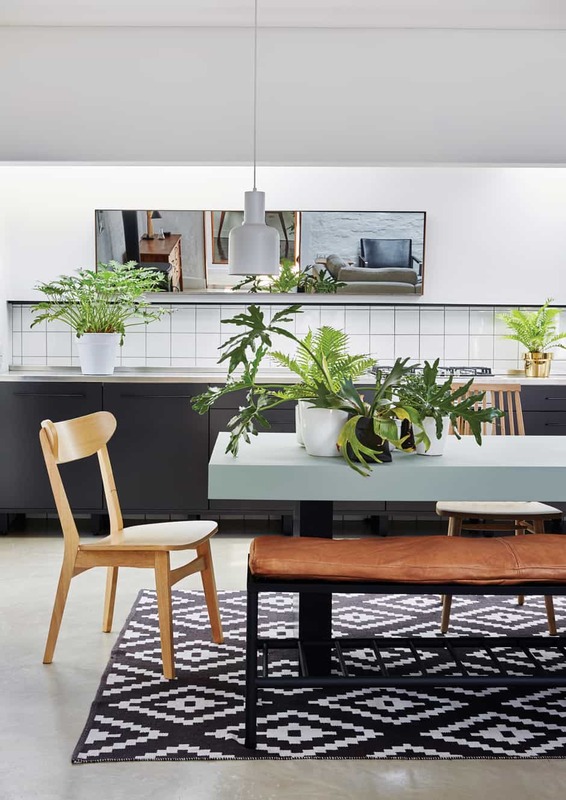 Pieces like the mid-century Scandinavian sideboard from Mødernist balance the look by adding colour, texture and warmth. Parkhurst has a central strip of pavement cafés, restaurants and stores where people stroll, dine and shop. The streets and sidewalks are alive in a way that most in Johannesburg aren’t, which probably has its origins in the verandahs that connected the original houses to the streets. “Every location has a spirit or character to it,” says Nico. To their delight, the pair found that from their home’s slightly elevated vantage point, they had a view of the Brixton Tower, a Johannesburg landmark. Realising that if they positioned their front gate to line up with the tower, they’d be able to see it from even the furthest point of the garden, Nico says, “we started planning elements of the renovation along that imaginary line”. KITCHEN Even the kitchen units are raised off the floor. 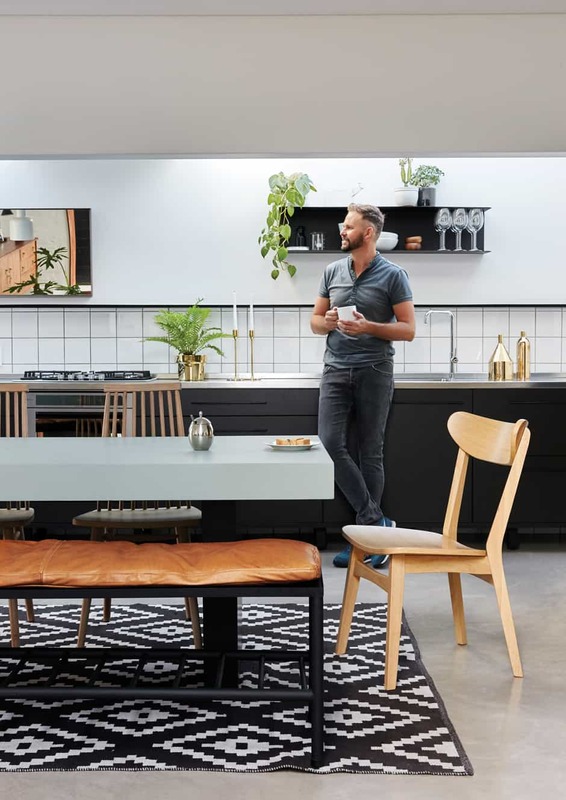 Nico (pictured) and Christo incorporated contrasting finishes throughout the house: here the sleek stainless steel benchtop offsets the rough painted walls. 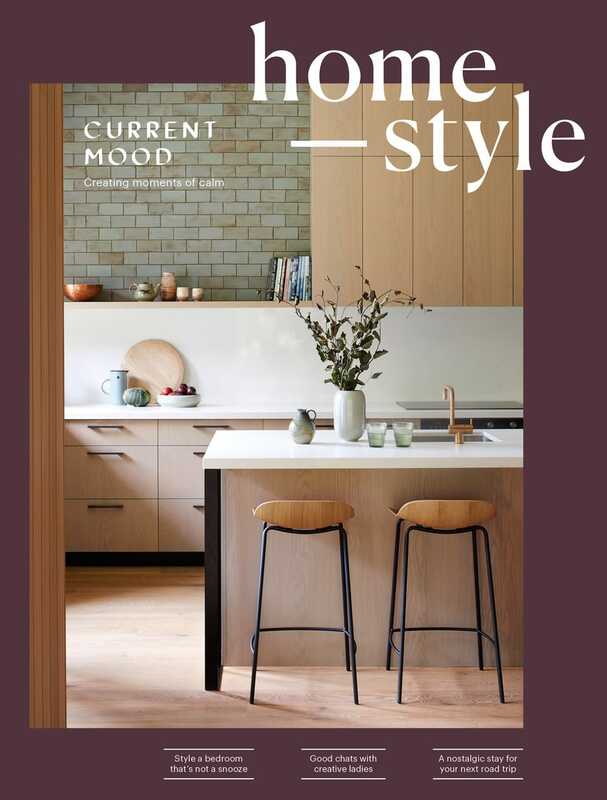 A slim steel shelf was placed along the top of the splashback because Nico has always disliked the way tiles “just end”. Around the table designed and made by Christo, chairs are mixed and matched to create a casual combination. 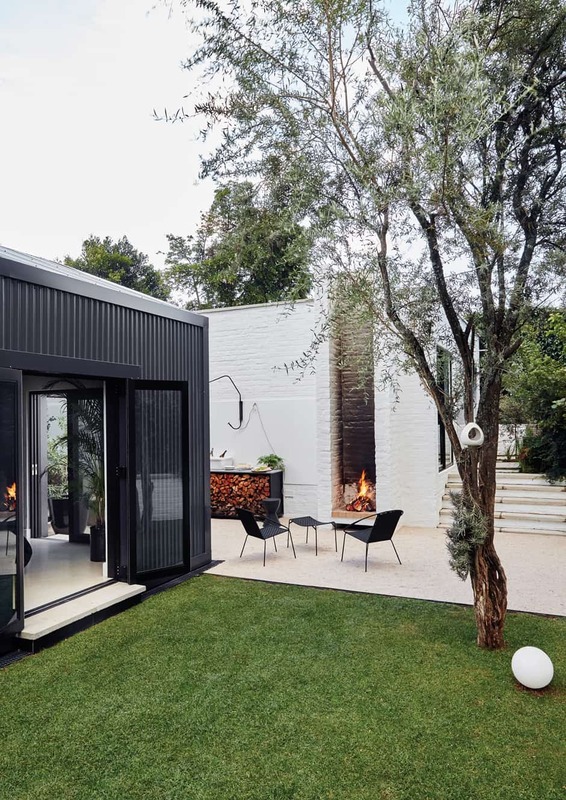 At the bottom of the garden, they built an outdoor fireplace that forms the focal point of an outdoor entertainment area, its chimney mirroring the tower. “The idea was to anchor the tower in the house,” says Nico. The invisible line ties the house to the city, plugging it into its surrounds and inviting the metropolis into its heart. That sense of connection to the city is further enhanced by the fire pit near the home’s street entrance, a sunken space surrounded by naturalistic planting. 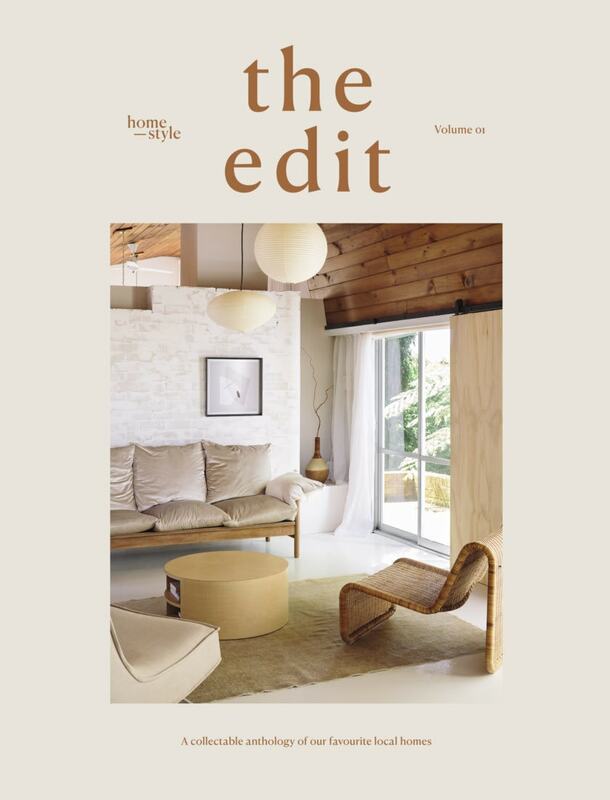 It’s part escapism, referencing the bush-safari holidays Nico and Christo enjoy, and part reinterpretation of the home’s old verandah, which they incorporated into their kitchen. Although people outside can’t see in, “sitting there, you can hear the street life”, says Nico. 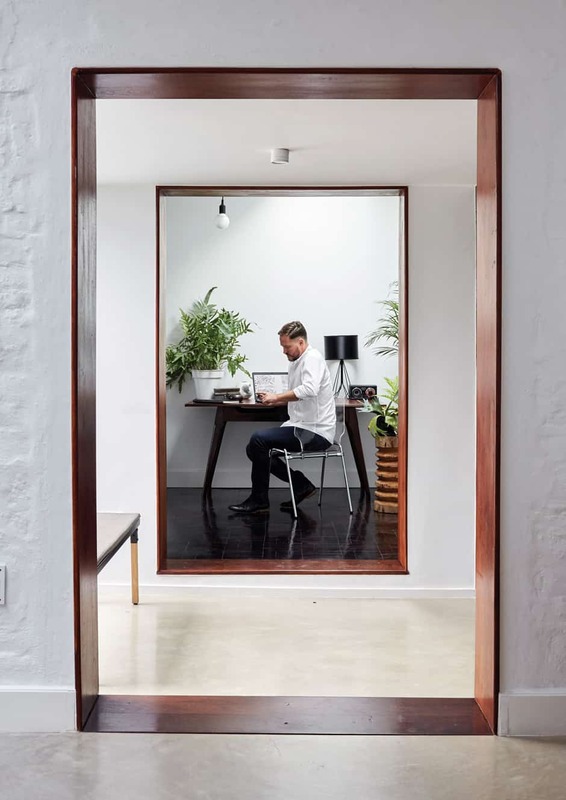 OFFICE Christo is pictured in the entry vestibule connecting the main house to the study, which creates a frame for the vintage desk, the lightness of the composition maintained by a transparent polycarbonate chair. Indoor plants bring an organic element to the clean-lined simplicity of the white, cube-like space, lit from above by skylights. The floor in this area is parquet salvaged from the rest of the house. When designing the entrance, the couple created an almost invisible glass box bridging the main house and the old garage (which they converted into a study). Inside, they opened up what was a warren of rooms and passages. Because the house was built to face the street, rather than being orientated to catch the sun, the rooms were dark and cold, so they introduced skylights and glass doors. They also worked out that if they chopped off the corner of the old garage at an angle, they could let in the light without losing any usable space in the new study. Christo planted a roof garden of succulents to soften the edge and visually blur the building with the view of the trees beyond. BATHROOM The main ensuite bathroom combines modern fittings with a traditional iron ball-and-claw bath. 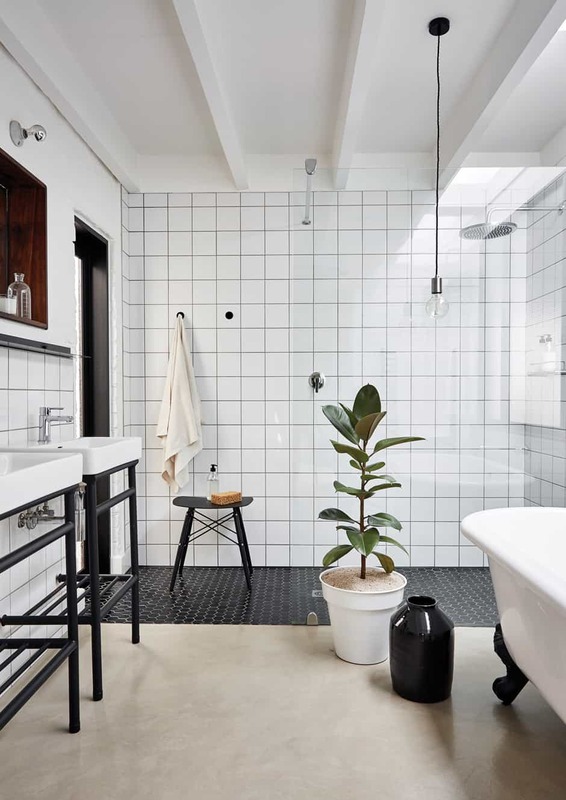 Christo designed the steel plinths for the basins, and a matching Eames-like stool makes a handy repository for bathing accessories. The narrow door leading to a courtyard outside is one of Nico’s favourite features as it creates the sensation of being in an outdoor shower. Throughout the house, there’s a contrast between raw, rough materials and more refined finishes. “We liked the combination of things,” says Christo. “The kitchen is precision-built and perfect, but the walls are rough and the floor is natural.” Salvaging as much of the existing parquet flooring as they could, they reassembled it in the study. The rest of the floor they screeded and sealed. 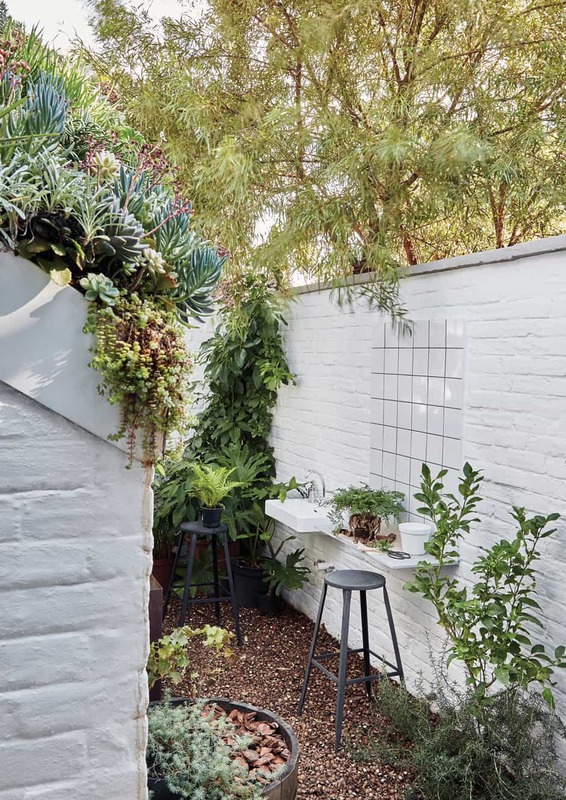 The kitchen extends into a little courtyard with a herb garden and a pizza oven; in fact, every room has an indoor-outdoor connection. The straight lines and precise divisions of the landscaping enhance the sense of space inside the home, while naturalistic planting in other areas creates contrast. KITCHEN GARDEN Herbs thrive in this area, where a wall-mounted planter helps to maximise space. This courtyard also features a pizza oven and a roof garden overflowing with succulents. Between inside and out, there are clever transitions. From the living room, you have to cross over a pond before you’re in the garden itself. The way the water and stepping stones focus your attention and change your pace as you walk across creates a kind of concentration that calms and enriches the experience. EXTERIOR The existing part of the house was wrapped in corrugated zinc, while the brickwork of the new sections was left exposed. Rather than having standard roof gutters, the couple opted for guttering that runs around the border of the house just below ground level.